As many Pu-erh lovers know, tea leaves harvested from the old arbor trees are of the best quality and have the best aging potential. 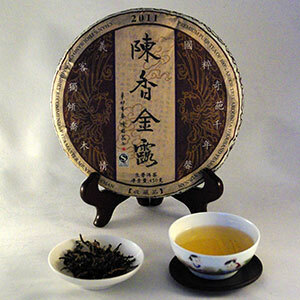 Among them, the most prized teas are those picked from trees that are several hundreds years old. The Chan’s Thousand Charm Collector’s Edition is made from these highly regarded leaves from very old trees grown deep in the forests of the high mountains in Yunnan. The production of this cake is supervised by tea master Vesper Chan according to his strict standards. This tea is soft, silky and full-bodied with a balanced “hui-gan.” After 8 infusions, a bouquet of Asian pear, sugar cane and olive flavors emerge. The fragrance lingers at the bottom of the cup long after the tea is drunk. This tea has great aging potential and appreciative values.